Eric: Cardale Jones. He should go off in his first chance to show off, and the fact that he’ll be allowed to run. WVa: Gonna have to go with Carlos Hyde. He’s the man and I want to see his carrying the rock. Dexter: I’m going to go off the wall and say Rod Smith. I got a good feeling it’s going to be one of the backs, and Smith has been making a good argument for a solid amount of carries. Mali: I’m going with the reliable Philly Brown on this one- he’s got a good connection with Braxton from last year, and has been rumored to have a couple of new wrinkles in his game this spring. Plus, Urban has said they’re looking to air it out on Saturday. Ken: Bri’onte Dunn. He’ll break at least one long run, perhaps for a score. Will not have a run for a loss. Jason: Everyone’s been talking about him, so I’m going with Warren Ball. That said, I’d bet we are talking about Michael Thomas again as this years “Spring Game All American”. 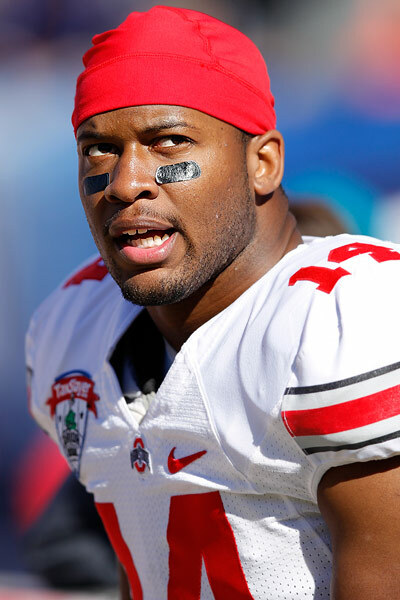 Janelle: Bri’onte Dunn…assuming they limit Carlos Hyde. 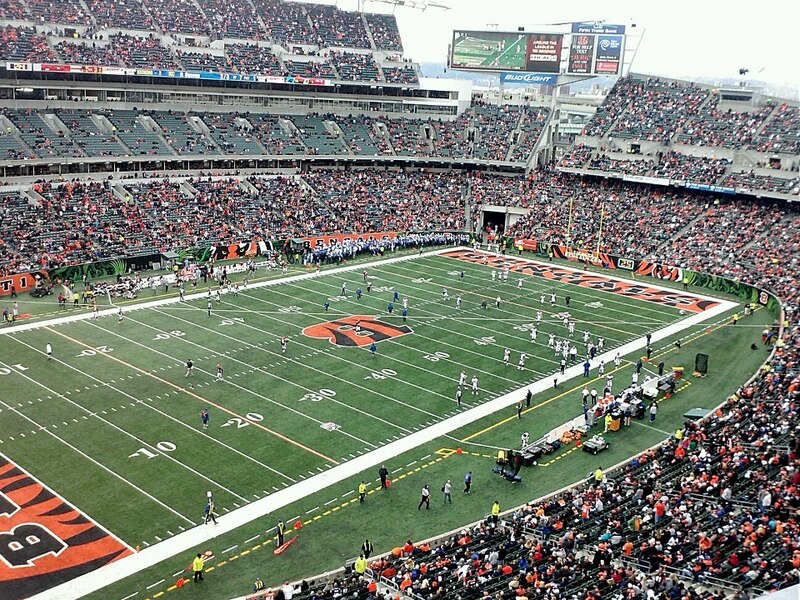 Dexter: Even though it’s the spring game, I am hoping the Ryan Shazier show 2013 has an early showing in Cincinnati. WVa: This could go to just about any of the youngsters but I’m definitely a Noah Spence fan now. Jason: Hopefully Curtis Grant. The Silver Bullets need him to start living up to his potential. Now. Mali: I’m a big fan of Spence, but I’m going to go with Doran Grant on this one. With Roby not playing, it’ll be his time to shine. Charles: Going with the majority and Curtis Grant. Eric: Noah Spence may be the answer here. He’s been beastly in practice, and the D-Line is going to have extra pressure on them to step it up. Who has the most tackles? 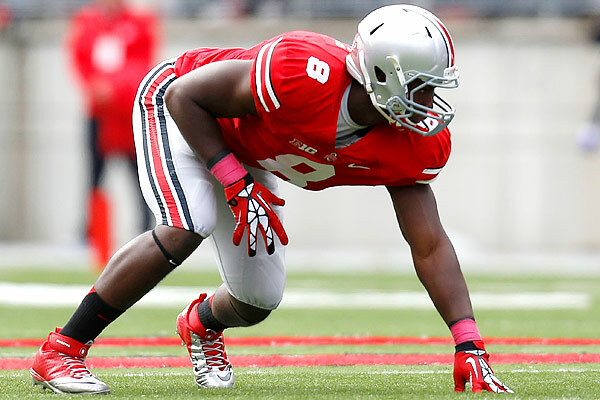 Mali: I want to go with Noah Spence, but the QBs not named Cardale will be off limits. So, let’s go with Christian Bryant just for giggles. Dexter: Another off the wall pick, but I’ll take Michael Bennett clogging the lanes. Jason: Any linebacker. Anyone other than a safety for that matter! Janelle: One of the linebackers. Eric: If the stories are true, Curtis Grant should be the guy to get the most opportunities to shine in the middle of the defense. Who has the most yardage rushing? Receiving? WVa: Rushing leader will be Carlos Hyde as well. What better way to send a message than against their own D. Receiving will probably be Michael Thomas again and this time it’ll mean something huge. Ken: Rod Smith will lead both teams in rushing yardage, Evan Spencer in receiving. Eric: Warren Ball will pick up the most yards, taking the opportunity to shine. Devin Smith should be our downfield go-to threat, and should pick up the most passing yards on only a handful of passes. Charles: Warren Ball for rushing, Evan Spencer for receiving. Mali: Rushing- Brionte Dunn, particularly with Carlos Hyde being limited, Braxton not being allowed to run, and Jordan Hall still recovering. Receiving- Michael Thomas, for the second straight year- although this time it will be a harbinger for a HUGE fall campaign (we hope). Jason: Offensive MVP Warren Ball leads all rushers. Evan Spencer is who I hope leads all receivers but I’m betting on Michael Thomas being the talked about spring game player again. WVa: PBS is a great stadium and fun to be in. I think it’ll be in the 45,000 range if not more. Ken: 55,000. I think it would have been 90K in The Shoe. But that wasn’t the question..
Dexter: If this is the Price is Right, I’d bet one dollar. I’ll Low ball and say 40,000. Eric: I’ll guess 45k will attend the game. Doubt many will waste an entire weekend to see a scrimmage, despite how well Buckeye fans travel. Mali: Smaller than it should be at 55K, although the beer and buses for students to the game should help. Though I didn’t pick him, I’m OK with Basil getting first points. Just as long as he isn’t leading scorer. Mali, does the WDYWTSOS winner get to do a guest post? A lot of disappointment in our picks- Shazier and Roby and Rod Smith and Jordan Hall aren’t playing, and Guapo won’t play much. Ah well- more winning for me!! Hmmm. It won’t affect me since none of the sit-outs were on my lists. However, ‘more winning for you’ is probably how this will play out. Will we have any staff on-site at the game? Doesn’t our Godfather (Jeff) live in the area? Jeff’s back up in Cleveland this week (I think)… Janelle may be headed down, though. Otherwise, there’s the BTN replay!! Devin Smith on a Braxton Miller pass scores the first points of the game. Point to Ken and Janelle. And Joe gets on the scoreboard!